By default there is no authentication of client connections to the default JMXMP connector. Since 3.1.1 password protection can be enabled through a number of additional properties in bootstrap.properties which will enable a SASL callback handler which verifies the supplied username and password combination. jmxserviceurl.jmxmp.password The password which may be encoded using the password handling mechanism. By setting the username property; the jmx.remote.profiles JMX environment property will be set to SASL/PLAIN if not already set. You can override this and dictate all the profiles required by specifying your own JMX environment in bootstrap.properties. For instance you might want to set jmx.remote.profiles to be TLS SASL/PLAIN but this will require additional configuration and use of the javax.net.ssl. * system properties. For an adapter running locally, for example on a developer workstation, just select the adapter from the left panel of the JVisualVM interface. 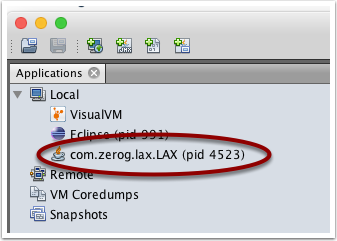 The name of the adapter main class is com.zerog.lax.LAX. The required connection information can be found in config/bootstrap.properties. The property jmxserviceurl indicates the protocol and port number to use. The default value is service:jmx:jmxmp://localhost:5555, which means the protocol is jmxmp and the port is 5555. Copy this url into JVisualVM and update the hostname to match the server the adapter runs on. Commonly, the adapter server is not directly reachable from the internet or a firewall is blocking access to port 5555. Since the JMX protocol doesn’t use authentication by default it would be very ill-advised to expose the JMX port directly to the internet. 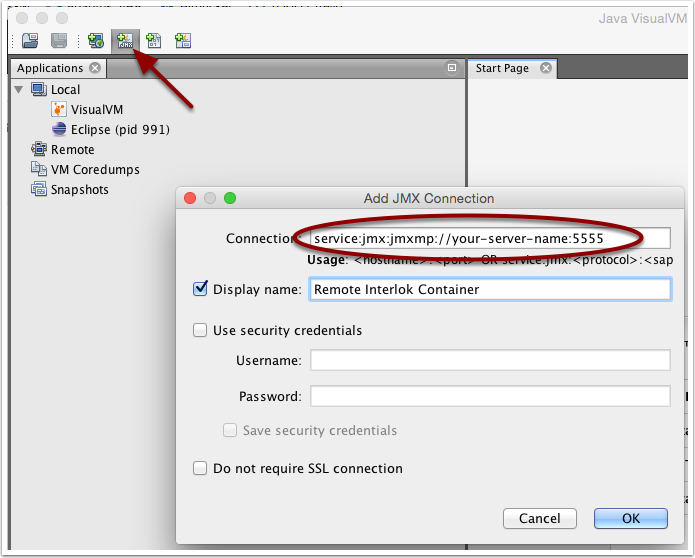 There are several solutions to still be able to access the JMX management interface. This creates an SSH connection to “proxy-host” and forwards port 15555 on your local machine to port 5555 on the “adapter-host”. Proceed to connect JVisualVM to “localhost:15555” and the connection will be forwarded as if you were connecting directly to the adapter server. A full discussion of SSH port forwarding and all possibilities is out of scope for this document. Please refer to the documentation of your SSH client for all options. In some cases you will want to control the adapter without resorting to a GUI interface like the bundled UI; there are a number of open source / freeware tools that can be used to achieve this; we will focus on jmxsh which is available from http://code.google.com/p/jmxsh/ as an example of how to do this. Jmxsh uses Simon Tuff’s “OneJar” which means that all the required libraries are in a single monolithic jar, we will have to patch it to make all the jmx remote libraries. It’s beyond the scope of this document to be a full reference to jmxsh, you will find the authors documentation a useful reference - http://code.google.com/p/jmxsh/wiki/Summary. Running it interactively is the best way to browse the MBeans that are available, and what commands can be issued.